I arrive at a quaint home office, decor warm and exchanged greetings even warmer. I quickly sit down as the game — The Sinking City — boots up on the massive screen, PS4 controller in hand. 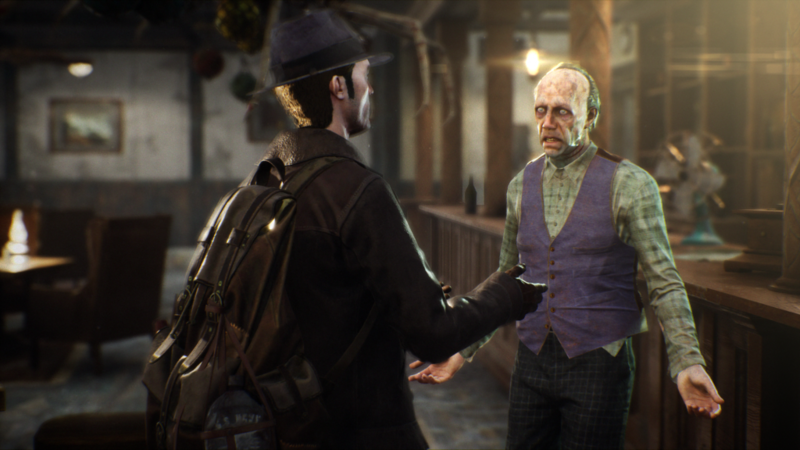 The Sinking City’s tone wasn’t anywhere near as warm as that welcome, though the game is enjoyable. You begin the game by diving into the mind of one Charles W. Reed, a former U.S. Navy diver turned private detective, during one of his hallucinatory dreams. As the disturbing imagery flashes abound, the contents of those dreams appear murky and opaque, as if the hero is submerged in a dark and deep ocean. I love this attention to detail, as it foreshadows later events nearly as well as the visions themselves. For those who may not be aware, The Sinking City is based on H.P. Lovecraft‘s The Shadow Over Innsmouth but features several changes. 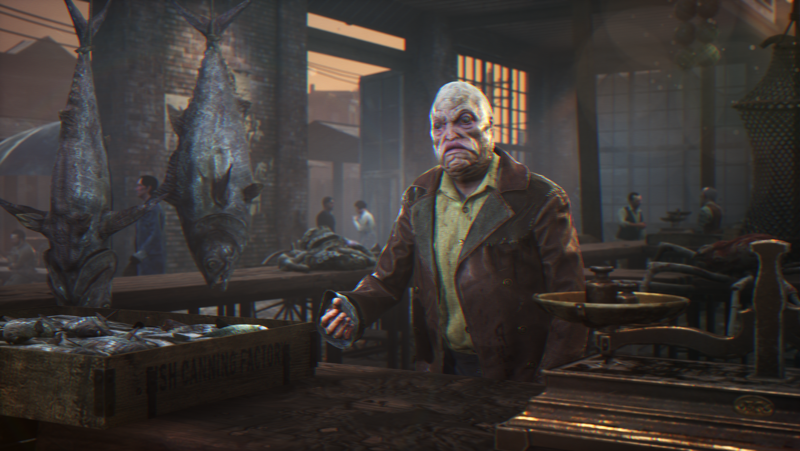 The protagonist is a detective in Massachusetts during the 1920s and not a college student, Innsmouth has already been ruined and the people have fled to the neighboring Oakmont City, and there is a prevalence of animal-human hybrids besides the fish/human Innsmouthers (such as the ape-like Throgmortons). Once Reed awakens in his room on a boat, the game starts and players are given a chance to learn the controls for picking up items and examining points of interest in the environment. As soon as all of his belongings are gathered, you can leave the room and speak to a professor about Reed’s ongoing investigation. 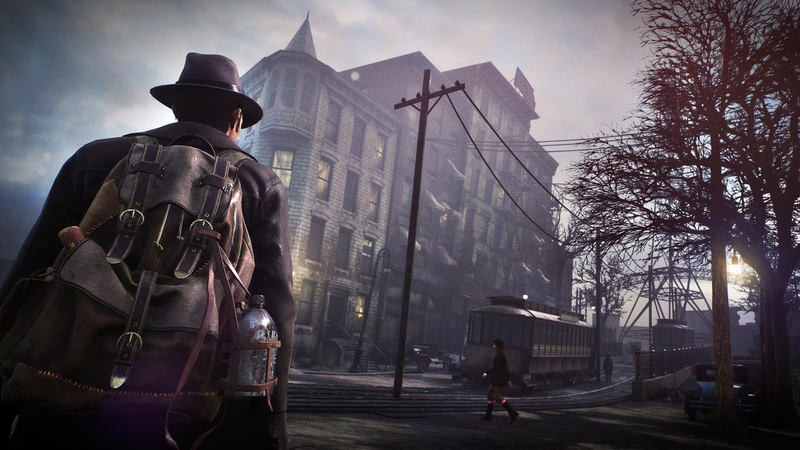 “The Sinking City is based on H.P. 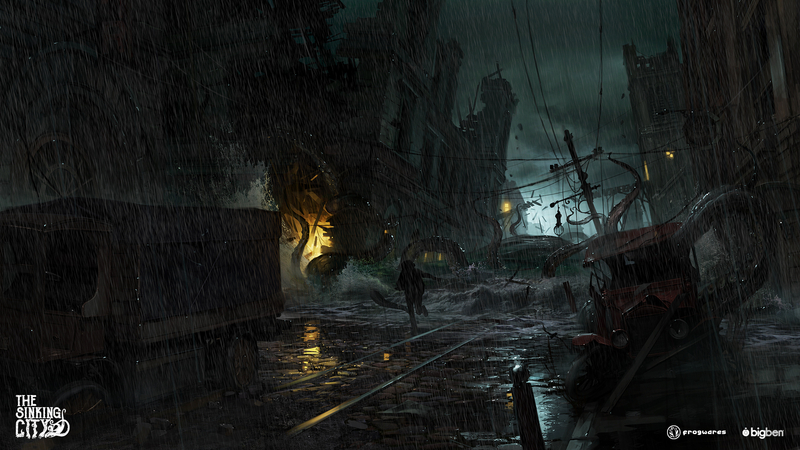 Lovecraft‘s The Shadow Over Innsmouth but features several changes. Reed has been tasked with discovering the cause of the mysterious events that brought Oakmont to the brink of collapse, all while resisting the mass hysteria that plagues the city dwellers. You find out from a nearby professor that what triggered the disaster striking the city is an event known as The Flood. This Flood completed shut off Oakmont from the outside world, caused the mass exodus of the Innsmouthers, and seems to be the origin of the mass hysteria crisis. This conversation is a great introduction to how the investigative conversational sections work. Essentially, when you question plot important people a dialogue tree opens up. It’s your job to both listen to the pertinent information they give Reed and to direct the conversation in a manner that presents you with more information. This song and dance is absolutely vital to gathering evidence and solving each case. The first denizen from the city you speak to is a man named Robert Throgmorton, head of a rich and powerful family. His son Albert, who was recovered from a failed diving expedition, is currently missing and the police are trying to track him down with little luck. Along with the useful info dump, Robert also reveals his hatred for the Innsmouthers that he feels are “invading” the city. Realizing that Robert may hold some valuable leads into the hysteria incidents, Reed ends up offering to look into his son’s disappearance as an exchange. Before you start the case, you’ll notice there are two meters: a traditional Health meter and a Sanity meter. Health is pretty standard; as you’re attacked by enemies (which will be detailed later on) the meter drains and losing all your health means you get kicked back to your previous checkpoint. For fans of the Cthulhu mythos, however, will be well versed in the concept of Sanity. See, us mortals aren’t meant to be aware about the cosmic horrors and other terrible creatures that exist outside the realm of normal existence. So coming into contact with these monsters slowly erodes at your mental state until you turn into a gibbering mess or worse. In the context of The Sinking City this means that the longer you’re exposed to these incomprehensible beings, more illusions and visions appear, making it more difficult to focus on what’s actually happening in the game. There’s also another effect, something that only occurs when the meter is dangerously low. As I backed out of a certain special mode, detailed below, Reed slowly put his equipped gun to his temple, hand shaking, before lowering it as his Sanity regenerates. That moment gave me chills and I still think about it long after my time with this game had ended. As you begin to investigate the fishermen’s quarters that Albert was kept in until he ran off, horrifying discoveries start to emerge. Speaking with the lone surviving fisherman and collecting evidence around the room reveals a horrible tale of several men going mad, resulting in tragedy. And then Reed’s abilities emerge — abilities that seem to be related to The Flood and the incidents. The main one is called the Mind’s Eye and it grants different effects. When ripples show up on the screen you can activate it, which can show you a static image of a past occurrence. It can also show you images of footprints or a person’s body afterimages, as well as evidence that wasn’t otherwise visible. This allows you to track down where missing people touched by the hysteria have wandered so you can find out where they’ve gone and what went down. Further aiding Reed is another skill called Retrocognition. This allows him to see the afterimages of past events as they occurred. The player is then tasked with guessing the correct sequence of them, complete with numbering them in order. As a note, these abilities use Sanity and letting it drain down too much can have some very bad effects on the protagonist, as stated above, so players must manage their use of these skills. All of this leads to the most important part of the game — unlocking deductions in the Mind Palace (found through the main menu) and piecing them together to draw new conclusions. This all leads to finding the truth and the case becomes that much clearer. From there, you must make hard choices about how to proceed. For instance, by the end of the case you find out what happened to Albert and who the culprit is. Reed first must decide in the Mind Palace whether the deed was done on purpose or if the suspect couldn’t control himself. Once you confront him, you must decide whether to report him to Robert or lie and protect him. The former causes more Innmouthers to be rounded up by the Throgmortons and the latter choice makes the detective ally himself with the Innmouthers. The second mission, which has you looking into the failed expedition that Albert was a part of, opens up a few more gameplay mechanics. The city opens up more and you really start learning how to traverse the vast location. There are streets and avenues, and players need to learn how to navigate through them as if you would navigate streets in real life. The game provides you with general directions, but it doesn’t hold your hand in finding the important locations. It does, however, let you set markers on the map so you can use the compass to track down said locations. Fast traveling also unlocks at this point, which is done through telephone booths spread out at certain points on the map. 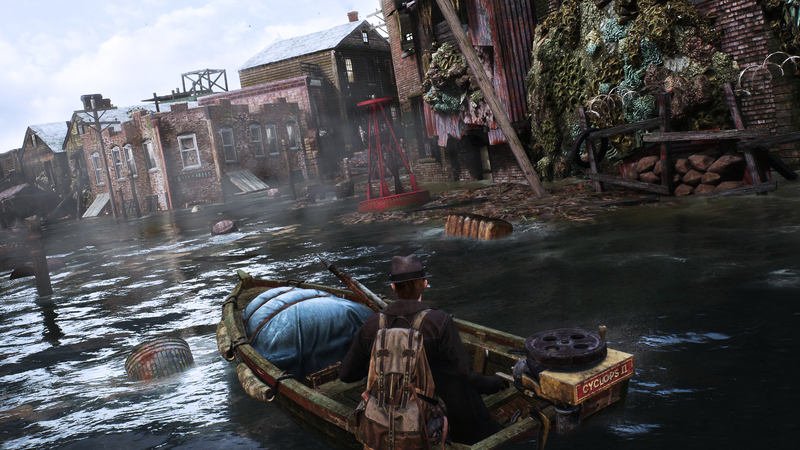 Some areas are flooded as well, requiring players to traverse the expanses of water using a boat that you can access at small docking points. Then there are archives, places that hold vast amounts of information such as a newspaper office or hospital. When you find a piece of evidence ,like a newspaper clipping that you can’t use it on its own, archives allow you to search pertinent information off the evidence in order to track down new leads. What’s especially cool about this is that you need to draw your own deductions on what to search based on the information present, forcing you to put your logical reasoning to the test. 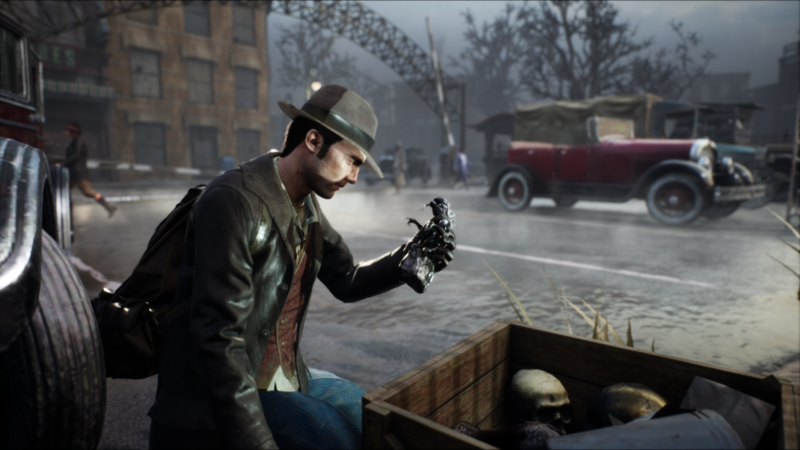 The Sinking City also likes to drop in interesting sections of gameplay. Toward the end of the second case, Reed must put his prior diving experience to the test by, after finding a suitable suit, diving down and investigating an underwater cave. I was impressed with both the historical accuracy in how the dive was setup and how unique the whole portion of this game felt. I also liked the fact that the hero’s previous career wasn’t treated as a throwaway backstory but had actual plot significance. Of course you don’t just walk around and investigate. Sometimes enemies from the unknown depths emerge, and Reed needs to take care of them. You can shoot enemies with the various guns you acquire either from simply finding them or creating them via the item crafting system. Aiming is easy enough with a console controller, but would be improved with a mouse and keyboard. Ammunition is very rare, which means each fire of that gun really does counts, giving every encounter tension as you try to line up the perfect shot to avoid wasting precious bullets. There’s also a melee attack with a shovel but its range is awful and should only be used as a last resort. A nice touch is that enemies slowly drain your Sanity meter when they’re close to you, adding another layer of micromanagement. There are also a few options available in terms of extra material and replayability. Reed can take up requests from some of the denizens of Oakmont such as a reporter looking for an interview or a doctor who needs help with some medical research. Dialogue choices presented throughout the many conversations in the game provide the replay value, as each quest has different endings depending on what moral choices you make in the world. 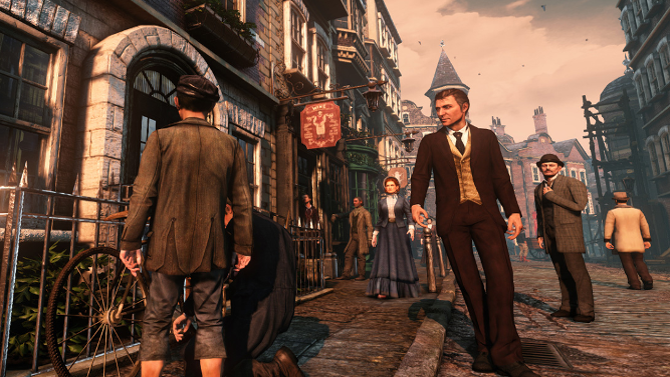 Players can influence the first case’s ending as previously noted, the election of a new city mayor, who will be the leader of the Carpenter family, and other events. The game also confronts you with multiple choices at the end, each resulting in different endings. An important point that needs to be addressed is the fact that, while incredibly imaginative, H.P. Lovecraft stories are fraught with very racist themes and I was worried that those aspects would mar my experience of the game. Fortunately, the development studio has done a standout job in removing those racist elements in a few simple ways. First, they do so by having characters of different races injected in the story without treating them as caricatures. Second, the use of multiple types of animal-hybrids meant that the focus wouldn’t be on how freakish looking the Innmouthers appear to others. Third, instead of the plot focusing on outdated and offensive beliefs, it brings up interesting and more relevant points about mass immigration by refugees, the effects they have on the economy, and how those in power take advantage of the less fortunate while still oppressing them. 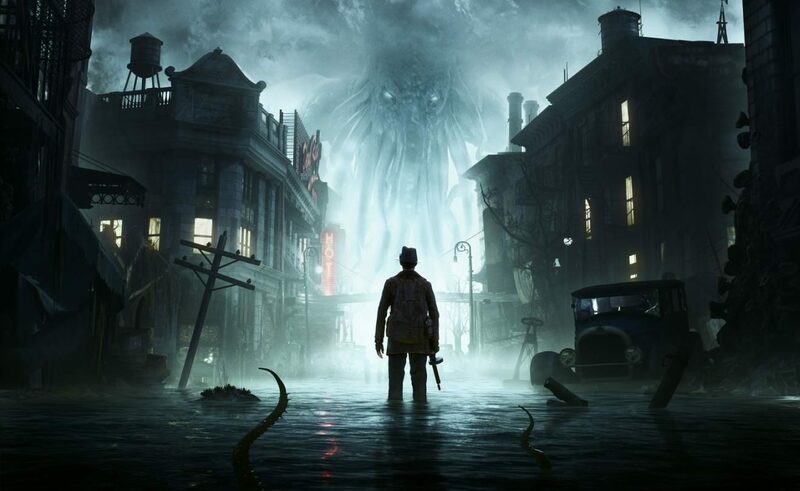 From the wonderful logic-based investigations that flow naturally as long as you pay attention to what you’re told, to the huge and living city that begs to be explored, to the wonderful voice work that brings the characters to life, and especially the Lovecraftian elements interwoven in both the story and gameplay, I had a great time with the portion of The Sinking City I played. 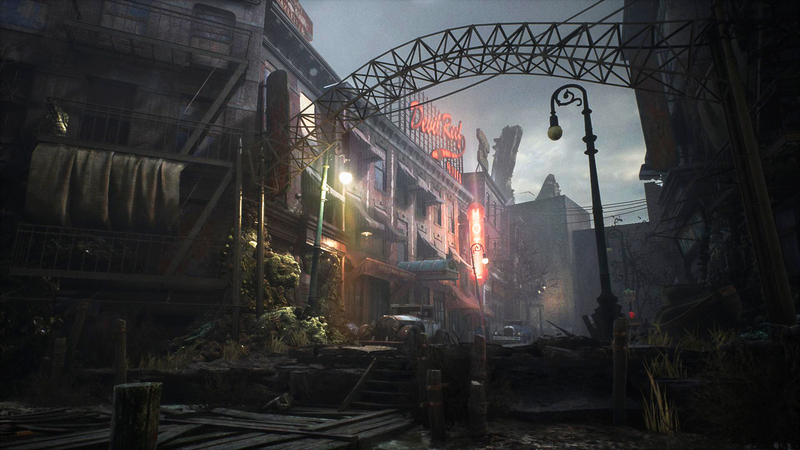 The graphics and color palette do an incredible job of setting the atmosphere of a dilapidated city so closed off from the world that bullets have take the place of money as the currency. I look forward to the release of The Sinking City on June 27th of this year for PS4, Xbox One, and PC. You can preorder the game now either for Xbox One or for PS4.